Threshold or Polarised endurance training; which produces the biggest performance gains? Research Summary: Threshold or Polarised endurance training; which produces the biggest performance gains? Intuitively, it would seem that if time is limited, you should be better off doing as much ‘quality’ work as possible with those hours rather than spending 80% at a pace which hardly seems to hurt at all (thus breaking the ‘no pain no gain’ mantra). Yet it has been reported anecdotally for a long time that the best endurance athletes train not only with high volumes, but that they maintain a disciplined program of relatively low intensity training 80% of the time and with high intensity for only about 20%. This contrasts with many amateur endurance athletes, who tend to spend most of their time in the middle ground – hard enough to push themselves out of the comfort zone, but not so hard that they become exhausted. High intensity means above lactate turn point (VT2), when talking is almost impossible and sustained effort is very uncomfortable. By low intensity, we are referring to intensity below lactate threshold (VT1) – i.e. talking pace. Researchers from the University of Stirling set out to discover not only which type of training program produced the biggest gains, but also whether a polarised program would be effective at all for athletes who have limited time to train i.e. about 7 hrs per week, implying that the quality portion would be only 1.5hrs per week. 12 trained cyclists each performed two blocks of 6 weeks of either polarised or threshold training, separated by 4 weeks of detraining to wash out the effects. 40 km Time Trial, muscle biopsy and other peak power measures were used to assess the effectiveness of the training. Both training periods produced gains in performance, but as the table below indicates, the performance changes were all larger for the polarised training program compared to the threshold one. This is especially surprising since the total training time spent in the conventional threshold program (7.4hrs) was 1hr longer per week than on the polarised one. 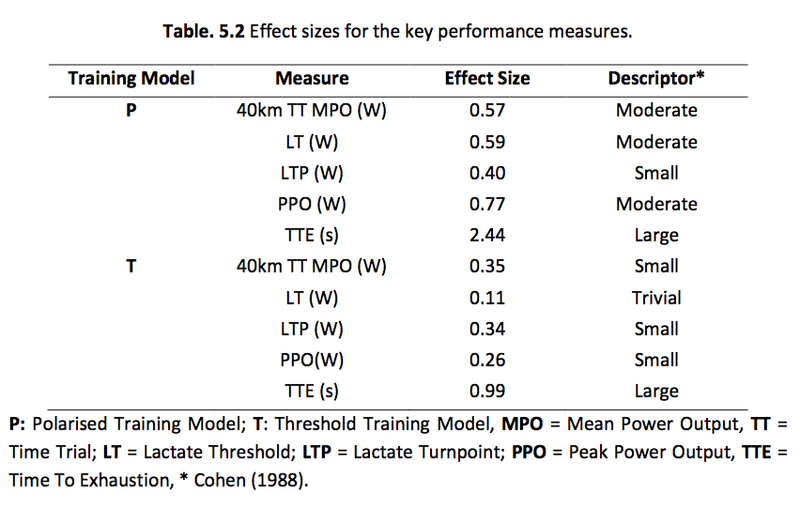 In summary, comparing the gains form the polarised vs. threshold programs: Peak power output PPO [mean (±SE) change of 8 (±2)% vs. 3 (±1)%, power at lactate threshold LT [9 (±3)% vs. 2 (±4)%, and high-intensity exercise capacity [85 (±14)% vs. 37 (±14)%, P < 0.05]. 1. The study confirmed the effectiveness of a polarised training model in well trained endurance athletes. Even when absolute training time spent in zone one is matched (this is the reason for the slightly greater total time per week spent in the threshold program). 2. Zone 1 is sufficient to maximise the increase in mitochondria in type 1 (slow twitch) muscle fibres, mainly used in endurance sports, such as cycling, running and long distance swimming. 3. The time spent in zone 3 may stimulate greater adaptations than the same (or even greater) time spent in zone 2. This would be in line with current thinking on High Intensity Training (HIT) which has been shown to produce significant benefits from short but intense training bouts. In order to sustain these high efforts though, the athlete needs to be well recovered. This limits the number of sessions that can be carried out per week. Overall, they said that ‘a polarised training model is recommended for trained cyclists wishing to maximally improve performance and physiological adaptation over a short term training period. 1. In a previous blog post it was shown that in trained athletes, HRV recovery following Zone 1 training is almost immediate. This implies that large volumes in this zone are not going to result in HRV decreasing, and in fact over periods of several weeks should cause HRV to rise steadily, pushing baseline values higher. Studies on runners (e.g. Martin Buchheit) and swimmers (e.g. Chalencon) have shown a clear relation between improvements in HRV and increases in aerobic performance. 2. The high intensity Zone 3 training should cause a dip in HRV if performed correctly. If not, it’s possible that they are not being performed sufficiently intensely. The authors of this paper used interval sets of 4 minutes full-on followed by 2 minutes rest as an example of high intensity training that had been effective at producing performance gains in cyclists that were already well trained. If we take the example of the 7 hours per week total then over 20 of these 4 min intervals have to be performed, probably spread over 2 or 3 sessions. Needless to say that if HRV is back to or above baseline, these sessions will be easier to perform to the required intensity than if you try to do them tired! As usual, we would be interested to hear from ithlete users who have personal experience to either back up or dispute these findings. I have done it myself and awaiting the results. I am not a pro, just amateur and on limited time. I feel this genetic information will be priceless on how I approach my training. I have trained using purely MAFF zone since last September, and over the period up to December, my HRV gradually declined compared to my ad-hoc training pre September. Once I started added in intervals in January, it started to climb back up. I believe that the MAFF zone should be the staple of training programme, but intervals done at near to 100% intensity for short bursts are also vital. If however there is a genetic predisposition to poor aerobic ability, then it seems we have to accept what we are, rather than trying to break down walls in order to improve, and end up on the hamster wheel of over-training. In saying that, we can improve within in our own genetic allowance, and I guess that is the key, it is just about accepting it. Yes, I did see it. I like Michael Mosley’s presentation style for these kind of lay-scientific programmes. Although I accept your point about ultimate potential being limited by genetics, I am a firm believer in setting oneself challenging targets & just seeing what you can do when you try. I do think that the achieved performance levels of many recreational athletes may be limited by their training patterns. yes I would agree about the challenging targets. I wasn’t suggesting not to, just merely making the point that we can potentially go too far and get too wrapped up in it, without making much if any significant improvement, hence leading to an over-trained state. But that’s the beauty of the HRV app, at least we have that to tell us when to back off. Great products! So I wonder what happens to an athlete who does this longer term? I’m not surprised they saw gains in the short term but what happens over a period of a year? Do they start to regress or perhaps become more injury prone? There is reasonable evidence that an ~80:20 ratio of low to high intensity training (HIT) gives excellent long-term results among endurance athletes training daily. • Low intensity (typically below 2 mM blood lactate), longer duration training is effective in stimulating physiological adaptations and should not be viewed as wasted training time. • Over a broad range, increases in total training volume correlate well with improvements in physiological variables and performance. • HIT should be a part of the training program of all exercisers and endurance athletes. However, about two training sessions per week using this modality seems to be sufficient for achieving performance gains without inducing excessive stress. • The effects of HIT on physiology and performance are fairly rapid, but rapid plateau effects are seen as well. To avoid premature stagnation and ensure long-term development, training volume should increase systematically as well. • When already well-trained athletes markedly intensify training with more HIT over 12 to ~45 wk, the impact is equivocal. • In athletes with an established endurance base and tolerance for relatively high training loads, intensification of training may yield small performance gains at acceptable risk. • An established endurance base built from reasonably high volumes of training may be an important precondition for tolerating and responding well to a substantial increase in training intensity over the short term. • Periodization of training by elite athletes is achieved with reductions in total volume, and a modest increase in the volume of training performed above the lactate threshold. 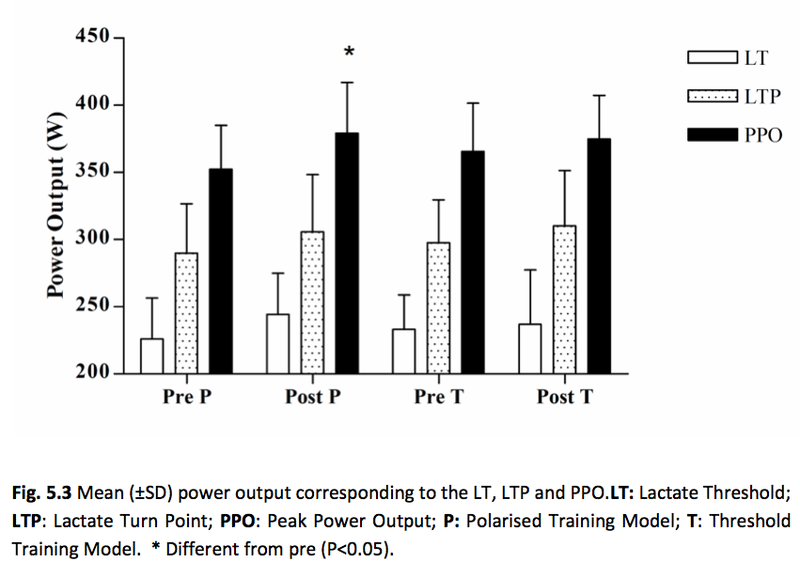 An overall polarization of training intensity characterizes the transition from preparation to competition mesocycles. The basic intensity distribution remains similar throughout the year. Great Blog – as ever Simon. The genetic component referred to above. Are you aware of any studies that have used this genetic component of “training limit” as a variable in comparison training tests? In some ways the genetic evidence is just what most people would annecodatly state as “I’m just not made to do that” (whatever that is). basically talking about my point that genetics are not everything and that the phenomenon of epigenetic can be beneficial – see this one too. There is an interesting scientific paper cited at the bottom. I expect a full analysis and response in due course!! 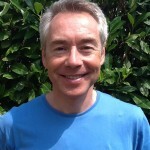 Mathew, very interesting articles on the epigenetics, thanks for highlighting those. It seems early days for this research. Maybe though there is still a genetic potential with regard to how epigenetics can influence us? Who knows?